Wylam Station, Northumberland. 1835. 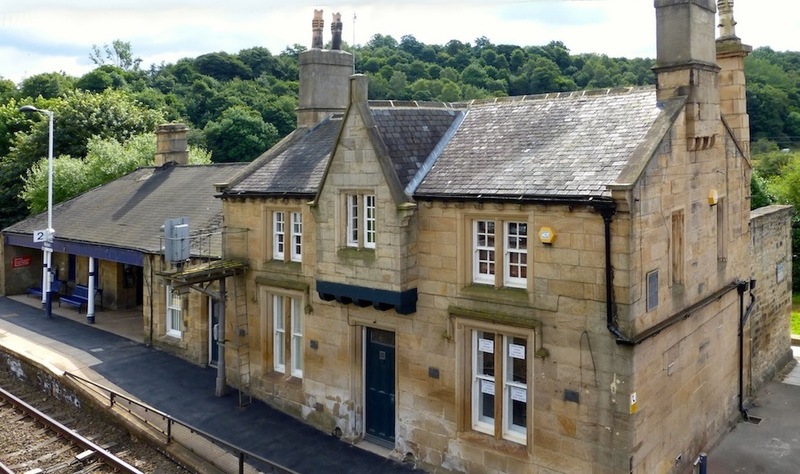 Originally part of the Newcastle and Carlisle Railway, and now managed by Northern Rail, this is "one of the oldest stations in the world still in passenger use" (Grundy et al. 636). Along with its two-storey stationmaster's house, it is Grade II* listed, and according to the list entry still has is original ticket-window. The house itself, seen here from the footbridge over the tracks, is Tudor in style and has some neat detailing, especially in its gabled oriel, with stylish stone corbels. There was much excitement when this section of the line was opened: "Two locomotives were purchased for the inaugural trip when six carriages were divided between two trains — one hauled by a Robert Stephenson engine (the Rapid) and the other by a Robert Hawthorn loco (the Comet)" (Smith). There were also three bands of musicians on hand, cannons were fired, and so forth. The footbridge, with the signal-box just beyond it. 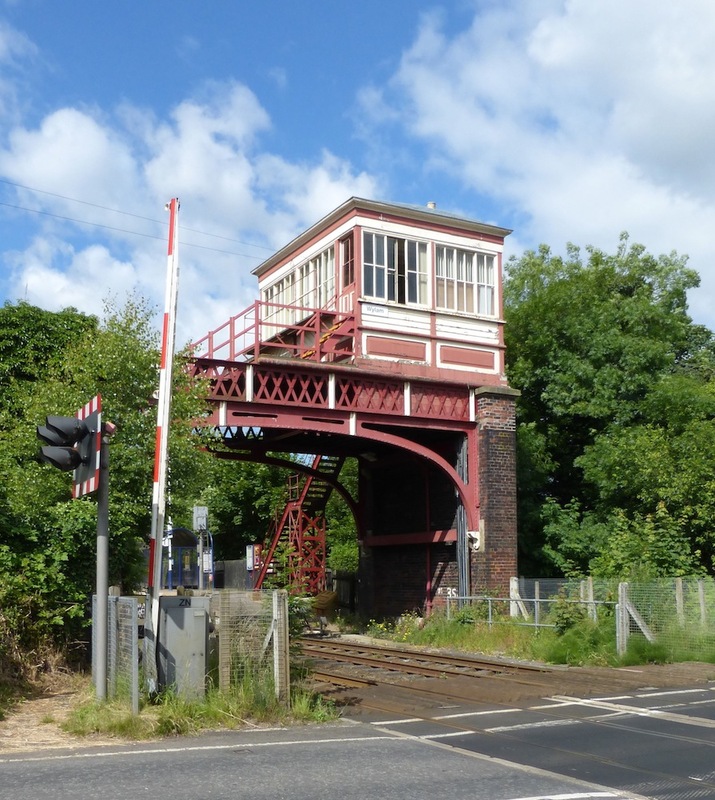 The footbridge and signal box are both Grade II listed. The footbridge, smart in its red paint, is later nineteenth century, and made of brick, wood and cast-iron — that is, as the list entry says, there are two brick walls either side of the tracks, supporting an iron frame "of 2 elliptical arches with trellis-work parapet above." Right: Wylam Station signal box. Left: Plaque to Benjamin Thompson on the side of the station-master's house, nearest to the road. The signal box just beyond the footbridge has a panelled wood base, boarded sides, and small-paned windows with horizontal sliding sashes in the middle. The roof is pyramidal, with a brick chimney-stack to the right (not visible here; see listing text), and cast-iron stairs to the rear (quite visible). 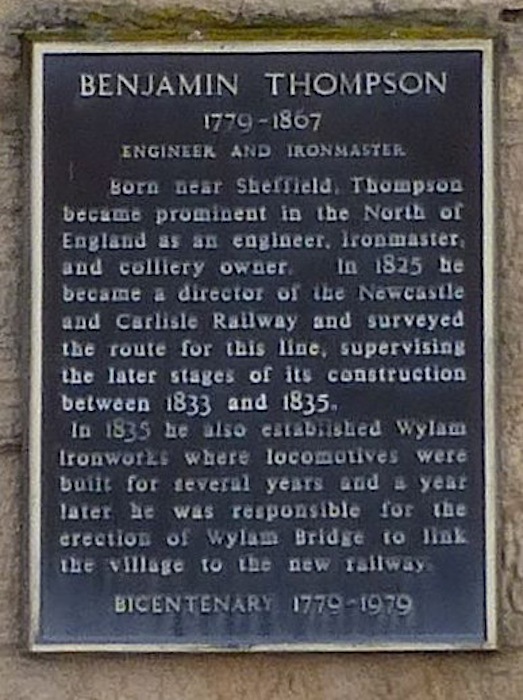 The route for this historic line was surveyed by Benjamin Thompson, an engineer, colliery owner and ironmaster who is remembered on a plaque on the station-master's house: having become the director of the Newcastle and Carlisle Railway in 1825, he "supervised the later stages of its construction between 1833 and 1835, the year in which he established Wylam Ironworks, where, the plaque tells us, locomotives were built for several years." He was also responsible for the bridge that links the village to the station, though the superstructure, originally of timber, has been replaced several times since then (Grundy et al. 637). There could hardly have been a more appropriate place for such an early station to have survived, for all this is just a short walk from George Stephenson's birthplace, where the great railway pioneer spent his early years. "Footbridge at Wylam Station." List Entry. English Heritage. Web. 10 September 2014. Grundy et al. The Buildings of England: Northumberland. London: Penguin, 1992. Smith, George. 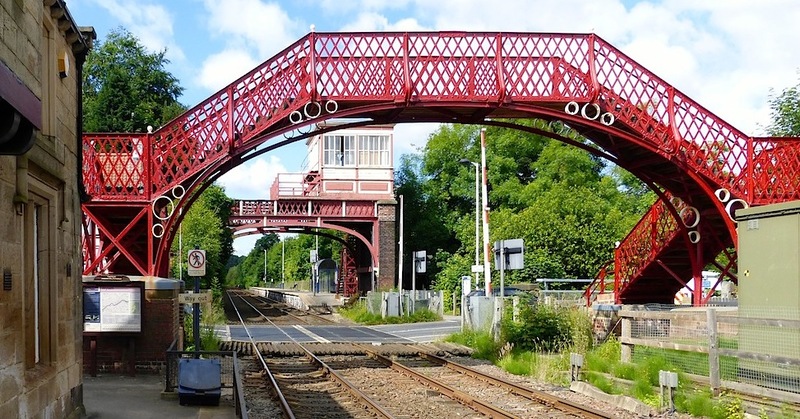 Wylam: 200 Years of Railway History. Electronic ed. Stroud, Gloucestershire: Amberley, 2013. "Wylam Signal Box." British Listed Buildings. Web. 10 September 2014. "Wylam Station and Station-master's House, Station Road." List Entry. English Heritage. Web. 10 September 2014.